Losing your wallet is always a bad experience, but a seagull absconding with your money and identification like it's a fish carcass is particularly unpleasant. That's exactly what happened to a man in Gloucester, Massachusetts on Saturday, but his trial ended up being a heartwarming story of collaboration and the human spirit. 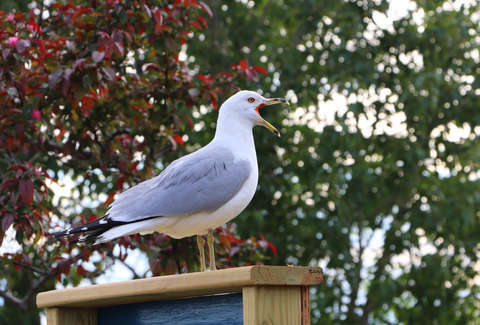 The seagull swooped down and stole the Rhode Island resident's wallet from atop a pizza box, and promptly dropped it on the roof of a building. The seagull's motives are unclear at this time. Thankfully, two strangers, one of whom was using a cherry picker to hang lights, were nearby at the time and volunteered to retrieve it. "There were two baby seagulls right there literally trying to eat the wallet," one of the men, Phil Peterson, told New England Cable News about the scene up on the roof where the wallet landed. "It was like the movie Birds. I was afraid they were going to pick my brains." To distract the baby birds, the other man, Mike Ramos, borrowed a flashlight from a police officer. "I took the strobe part of the flashlight and he went on the roof and every time they tried to go after him, I would shine it at the seagull and it would discombobulate them," Ramos explained. Thanks to their bravery, the wallet was recovered. "There's a whole crowd at that time and they're giving him the thumbs up and it was just the craziest thing I ever saw in my life," recounted Peterson. And that's the story of how four grown men banded together to foil the dastardly plot of a small seabird.